Update: click to get to this post for a metric modulation calculator! Second update: check here for the new, easier-to-use calculator! Alright, let’s tackle a rather hands-on technical tool. Metric modulation (or more accurately, tempo modulation) is the shifting of the beat from one rhythmic value to another. For example, simple metric modulations might change the beat from a quarter note to a half note, or an eighth note to a sixteenth. Pioneered by the great (and still alive, remarkably, at 102 years old) composer Elliott Carter, it allows tempo switching to be exact. You don’t get a precise metronome marking with “ritardando to Largo”, “accelerando to Allegro”, or a good change from “quarter = 120” to “quarter = 140” (when players have to guess what 140 is because they can’t use a metronome onstage). But, with metric modulation, so long as you remain in time, you will achieve your target metronome marking every time. And, metric modulation is not just for people like Mr. Carter. It can be of great use for slowing down, speeding up, playing around with a listener’s ear (are we in 3/4 or are those triplets? ), and shifting things to new places. For example, I used a triplet metric modulation in my piece Sleepless that shifted the quarter note triplet to be the new quater note (see figure below). Here the quarter note was 96, and the quarter note triplet was 144. I used this metric modulation to change the tempo from q = 96 to q = 144. I did this by having a quarter note triplet phrase repeat, and then continuing on as if the triplets were the new quarters. I was then able to operate freely in q = 144, allowing the piece to continue, but 1.5 times as fast. So, how do you determine what tempo you will be modulating to? Let’s use the example above to explain. The quarter note was 96. Therefore the half note was half as fast, or 48 (96 divided by 2). There were three triplets in each half note, so each one was three times as fast as the half note. 3 x 48 = 144. Therefore, the quarter note triplet had a speed of 144. I then made the quarter note triplet become the new quarter note. Therefore, the quarter note’s beats per minute went from 96 to 144. One major tip in figuring out the target metronome marking is to find a common beat grouping (see two examples below). 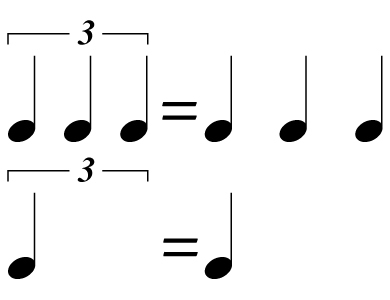 If you want to change the sixteenth note quintuplet to be the new eighth note, then use the common beat of 1 quarter note times five; there are five sixteenth note quintuplets in one quarter note. Eg. If you’re given that the sixteenth = 120, the quarter metronome marking = sixteenth/4 (because the quarter is 4 times slower than a sixteenth), so 120/4 = 30. Therefore, quarter = 30. Five quintuple 16ths in 1 quarter means that each one is 5 times as fast as the quarter, so 30×5 = 150. This is what we’re going to call the new eighth note, and in this case, the tempo hence went from sixteenth = 120 to sixteenth = 300, an increase in tempo of 150%. If you want eg. 1 half note to be the new eighth note triplet, it becomes a bit simpler because we’re going from non-tuplet to tuplet. Let’s say the half note = 180. There are six eighth note triplets in a half note, so each half note is six times slower than its eighth note divisions. So, if the half note is now the new eighth note division, we divide it by 6. 180/6 = 30, so the half note has slowed down by 600%, and the tempo has gone from 180 to 30. If we are in 4/4, quarter note = 60, and want every 5 sixteenth notes to define the new beat instead of every 4, then we know that we are putting 5 sixteenths in the place of four, so we multiply it by 4 to get to sixteenth = 240, and divide it by 5 to show that we are now putting 5 in the place of 4. The result is 240/5 = 48. The result makes sense: we are essentially cramming more sixteenth notes into one beat, so the more sixteenths in a beat, the longer each beat takes, and the slower the beat. This technique can be a bit hard to manage at first because of the math involved, but it’s only division and multiplication by small numbers, and you can check your work qualitatively: egs. a quarter note becoming the half note should make the tempo faster, an eighth note becoming a sixteenth should make the tempo slower, and cramming fewer subdivisions into a beat should make the tempo faster. Try it out, because there are so many creative and useful ways to implement metric (tempo) modulation. Thanks for reading; I know it has been a while since my last post (work has been busy)! Dan, How do I notate “8th note = 8th note” in finale 12. Thank you! You would need to use the music font of your choice (eg. Maestro or Engraver) and punch in the key command for an eighth note. You can find the key commands in Finale 2014 (sorry–I don’t have ’12 anymore) in Help > Character Sets > Click your font. Hi Dan, my question is: How do you get back to the initial tempo regardless to the modulation you decide to play throughout. Hi Saddler, to return to the initial tempo you just reverse the process; if you move from quarter note equals 80 to quarter note = 160 by notating eighth note = quarter note, write quarter note = eighth note and reverse the math. Thank you for the comment!